Inspiring lines of poetry on a wall is to be installed in London's Olympic Park to help boost participating athletes in the 2012 Olympics. Poetry fans are being asked to nominate their favourite verses as part of the Winning Words project. 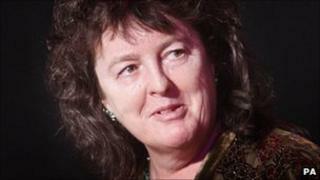 A panel of judges, including poet laureate Carol Ann Duffy and author Sebastian Faulks, will determine the chosen lines. The poetry will then be engraved on a wall in the Athletes' Village. William Sieghart, who created the Winning Words idea, said he was "delighted that poetry would be one of the ways of inspiring athletes". Olympics 2012 chairman Seb Coe said it was a "great initiative" that would "help make the Village an inspiring place". Poet Daljit Nagra, Sarah Weir from the Olympic Delivery Authority and BBC Sports presenters John Inverdale and Clare Balding will also feature on the judging panel. Balding has suggested her nomination would be Edgar Guest's It Couldn't Be Done and Inverdale chose The Victor by CW Longenecker. Inspiring poetry nominations can be submitted until 6 January. The announcement comes just two days after more details were released about what the Cultural Olympiad will include. Actress Cate Blanchett, Blur's Damon Albarn and artist David Hockney will be involved in a 12-week arts festival which will run alongside the sporting event.